Is homeopathy indigenous? How does it cure illnesses? Homeopathy has been around for about 215 years. Its origins are German. It was brought to India in 1810 when few German physicians and missionaries came to Bengal. Its popularity got a fillip after Maharaja Ranjit Singh (the then ruler of Punjab), who had lost his voice due to paralysis of vocal cords; got cured using homeopathy. Today, India boasts of having the highest number of homeopathic organizations in the world. Homeopathic remedies are nano-medicines administered in micro doses to stimulate the body's healing power. These remedies contain potent energies, which treat the symptoms and cure the diseases at a deeper level. Is Homeopathy is scientific theory? How does it differ from Herbal Medicine or Ayurveda? The major difference is that Homeopathy does not use any material substance. It treats underline causes of illness rather than addressing outward symptoms. Herbal medicine is based on the use of pure constituents from plants and the biological response varies directly to the dose or concentration of the remedy. Ayurveda, a more traditional (and older) treatment, uses various alternative forms of healing such as herbs and chemical along with physical elements such as yoga and massage. Many believe quacks' theories but for your information, it's supported by WHO and practiced in over 100 countries. It is approved by the US, European FDA and the Indian DCGI. So does cure it all? Foe what ailments would you NOT recommend Homeopathy? Diseases can be divided into two categories to understand the scope of Homeopathy; Chronic and Recurring; Homeopathy is very effective in these cases and has considerable success in their treatment (asthma, vitiligo, psoriasis, migraine, Eczema and so on). Acute and Critical; Homeopathy is less effective in cases requiring urgent attention. Also, the critical nature of condition such as Heart Attack, High Fever, Severe attack of asthma, severe infection would warrant allopath. Also, I do not prescribe Homeopathy in cases such as Malaria, typhoid and T.B as these diseases take long to be treated and usually allopathy fares. Homeopathy has its own set of limitations, as does allopathy. I want to take other medication while my Homeopathic treatment is underway. Absolutely. Homeopathy, in some cases like diabetes, asthma, arthritis, ulcerative colitis, can be married to allopathy and help in successfully managing the ailments. It's a wrong notion that Homeopathy cannot be used in conjunction with other therapies. In our unregulated Homeopathy market, how do I trust Homeopathic products from my local health food store? How do I even trust the Doctor? The Government of India currently manages over 200 Homeopathy medical colleges, but feels to regulate the Thousands of Homeopathic manufacturing units. Regarding the products, one needs to look out for properly labeled products. The chances of them being phony these days are low, if it is a reputed health food store. A Homeopath is just like any other Doctor. His qualifications would be the same as those of an Allopathic Doctor. So, the way one chooses their Allopathic Doctor (referrals, word of mouth, qualifications, etc.) is the same for the manner in which one would choose a Homeopathic Doctor. Allopathy would give me a better solution, right? That Homeopathy takes long to cure an ailment is not completely true. Since the science is proper for treating chronic (long standing) disease, they obviously take time to be cured. For a given nature of the disease, For instance asthma, Homeopathic may take a year and a half to give lasting results. 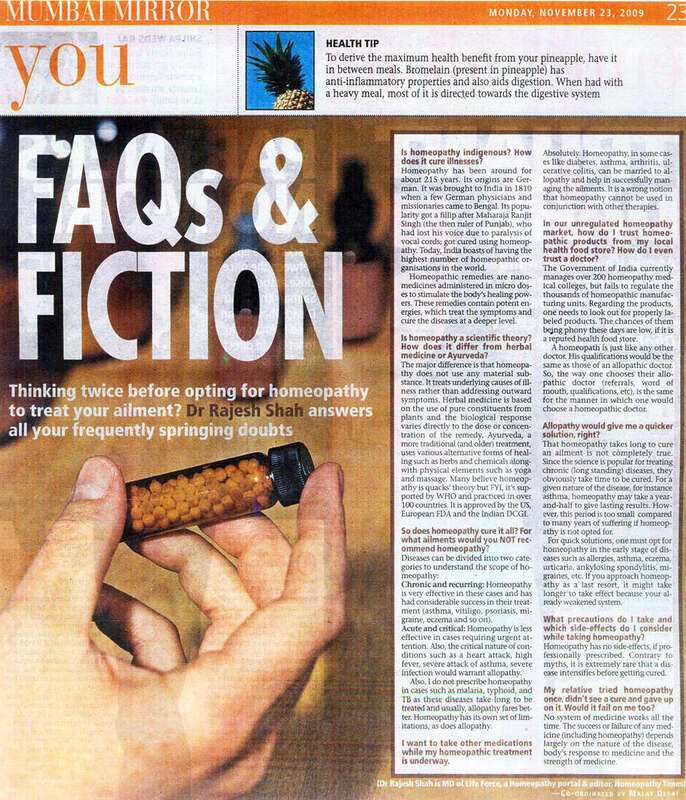 However, is too small compared to many years of suffering if Homeopathy in not opted for. For quick solutions, one must opt for Homeopathy in the early stage of diseases such as allergies, asthma, eczema, urticaria, ankylosing spondylitis, migraines, etc. If you approach as a Homeopathy 'last' resort, it might take longer to take effect because your already weakened system. What precautions do I take and which side- effects do I consider while taking Homeopathy? Homeopathy has no side-effects, If professionally prescribed. Contrary to myths, it is extremely rare that a disease intensities before getting cured. My relative tried Homeopathy once, didn't see a cure and gave up on it. Would it fail on me too? No system of medicines works all the time. The success or failure of any medicine (including homeopathy) depends largely on the nature of the disease, body's response to medicine and the strength of medicine.